Studies have already established a direct link between dental health and overall health which means, your body will suffer if your teeth and gums have any problem. For that reason, you are supposed to follow oral care routine daily and religiously as it ensures total health. Sometimes, however, oral care is not enough in preventing dental problems and we should understand that well. Our teeth, mouth, gums, and tongue are sensitive and not treating them well may lead to a variety of dental risks. In fact, there are dental problems which are quite common and which you need to treat at the earliest to lead a disease-free life. Tooth decay is a common dental problem which is likely to occur to people of any age groups and gender. Also referred to as cavities or dental caries, it occurs due to plaque formation on the teeth. When tooth decay strikes, there will be acid produced in the mouth that can erode the enamel and form holes. Eating sugars and starches can lead to the formation of the bacteria causing cavities or tooth decay. Since it’s a lifestyle problem, prevention is easily the best remedy. Cavities can’t be reversed but there are treatment options to fill and repair them. 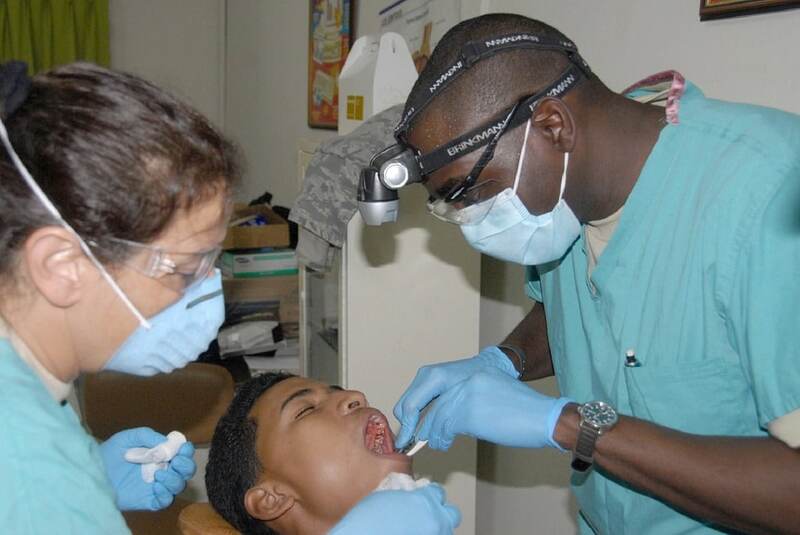 Some of the treatment options include filling, crown, tooth extraction. Gum disease or periodontitis is a dental problem caused by bacterial infection. The bacteria causing gum disease develops due to accumulations of plaque in the mouth. It can eat away at the gum tissue and weaken the tooth structure gradually. However, the right treatment can help reverse the problem and let you counter gum disease easily. A good dental care routine coupled with immediate treatment can help you minimize, and also reverse, the risk of the gum diseases in their initial stages. Some of the risk factors include poor dental hygiene and patients with diabetes. For infected gums, your dentist may prescribe antibiotics and help you tackle the problem head-on. Tooth infection is among the common dental problems caused by the infection of the root or the bottom part of the tooth. When this infection occurs, patients are left with the root filled with harmful bacteria. This is how the nerves and the pulp get damaged causing a grave threat to your dental health. In some cases, a cavity, fracture or deep crack can also be the reason behind root infection. If not treated in a timely manner, this problem could develop into painful abscesses causing facial swellings in extreme cases. Root canal treatment is the only option available for tooth infection of severe nature. The procedure is complex yet painless and can get complete in little less than two hours. Teeth misalignment is also a common dental problem which can leave one with crooked, protruding or badly aligned teeth. When teeth are not properly aligned, there will be damage to smile and facial aesthetics as well. In some cases, alignment also causes bite-related problems to impact everyday eating and chewing capability of individuals. Braces and aligners are often advised fixing dental alignment issues. And if the focus is on improving the look and feel of smile, one can also consult a cosmetic dentist and get the desired result. When your teeth are consistently exposed to sugary snacks or drinks, they are bound to have enamel degradation issue. The enamel will wear down due to the presence of acid in corrosive materials making it weak and stained. Using too much force while brushing, using teeth as tools for opening bottles, crunching ice, biting nails are some of the habits that can also cause enamel to wear down. Since enamel degradation is a lifestyle issue, prevention remains the best cure. You can cut back on soft drinks and sugary items, start drinking more water and follow right brushing etiquettes to keep the problem away. Bonding support and repairing are two treatment options available when the enamel wears down. So, it’s better to spot the sign of troubles with your enamel and save it from eroding further. Dry mouth or xerostomia is a dental problem caused by a lack of saliva in the mouth. It can also occur due to using some prescription medications. With a dry mouth, there is always a risk to your teeth and gums as neither they get hydration and moisture nor get adequate cleansing. In fact, saliva can help scrub away plaque and bacteria and foods to keep your breath fresh. People with dry mouth should eat plenty of water through the day as it helps greatly. They can also chew sugar-free gums to ensure a boost to saliva production in the mouth. And yes, one can also inform the dentist new Hyde park NY about any medications that you think is causing the problem. Thanks for explaining the different dental problems, such as periodontitis which is a bacterial infection in the gums. If you have any of these issues, you’d probably want to find a dentist in your area that offers treatment as soon as possible. Doing this could ensure it’s handled by someone who knows what they’re doing so that it is properly treated in order for you to avoid having it happen again.